Degree One Events: GZA aka The Genius (WU TANG CLAN) at Sugar in Victoria. GZA aka The Genius (WU TANG CLAN) at Sugar in Victoria. The 'Genius' member of the legendary Wu-Tang Clan is making his return to Victoria!! With a huge list of classic material from his group such as "Enter The Wu-Tang Clan (36 Chambers)" and "Wu-Tang Forever" to his crazy successful solo projects "Liquid Swords", "Beneath The Surface" and "Pro Tools", GZA will be dropping hit after hit all night long!! GZA continues to make solid music with his fellow crew mates as well as appearing on several recent projects with DJ Muggs, Black Milk, Pete Rock and DJ Premier etc. 2007 saw GZA teaming up with his Wu-Tang Clan to record the group album 8 Diagrams, and in the ensuing controversy, defended both Raekwon and Ghostface Killah's rights to speak their mind, and RZA's production job on the album. In the summer of 2008, he released the album Pro Tools which featured production from Black Milk and past collaborators Jay "Waxxx" Garfield, RZA, Mathematics and True Master. 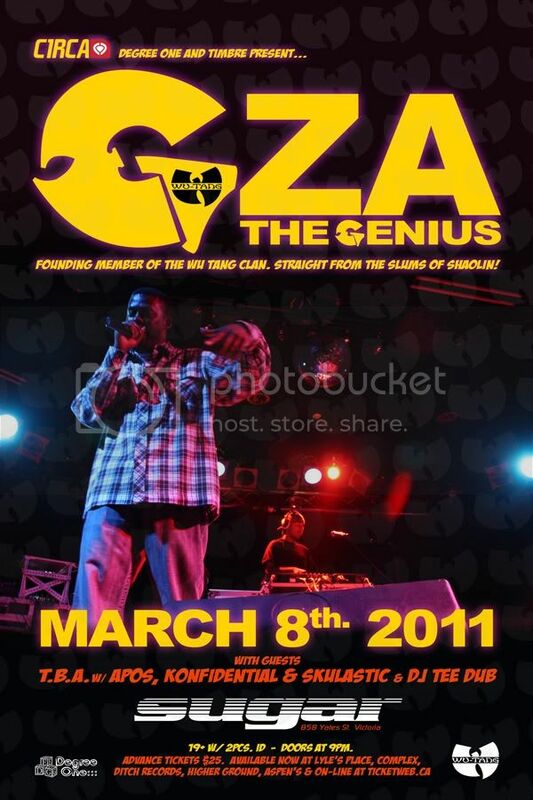 In 2009, GZA made appearances on two more Wu-Tang Clan albums. The first being on a song entitled "Stomp Da Roach" on the album Dopium, by fellow clan member U-God, the other being appearances on the tracks "We Will Rob You", "Rockstars" and "House of Flying Daggers", on Raekwon's Only Built 4 Cuban Linx... Pt. II. The Genius continued to tour during the year, appearing on the "Rock The Bells" lineup and also performing at the NXNE music festival in Canada. Recently, RZA confirmed that he will be producing Liquid Swords II: The Return Of The Shadowboxer, which is tentatively due out in Fall of 2010. The GZA also made an appearance in a video for Devendra Banhart's song titled "Baby". For Liquid Swords II, he has recently confirmed with Examiner.com that Killah Priest will hold a solo song ala 'B.I.B.L.E.' to act as the closer to the album just like the original. He will also be appearing on the upcoming collaboration album between producers Pete Rock & DJ Premier V.S. album appearing on Premier's track. Throughout the years GZA has maintained a reputation as a skilled wordsmith with a highly recognizable and authoritative delivery.